We are a family-friendly hotel and inn with a long tradition. According to tradition, Marie Antoinette, who was the daughter of empress Maria Theresa, and Matthias Klostermayr known as the Bavarian Hiasl were guests in our hotel in 1770. Today, the "Goldener Löwe" has been owned by the family for 80 years. Our hotel is located in Denzingen and is only 2 kilometers away from LEGOLAND® Deutschland. It is a perfect starting point for trips, hiking and cycling due to its central location. Here, you can leave daily life behind whether you are on holidays, on a business trip or on a stopover. Note please that our restaurant is only available for our residents. Our hotel offers single rooms, double rooms as well as three-bedrooms and four-bedrooms. Especially the four-bedrooms are very suitable for families. 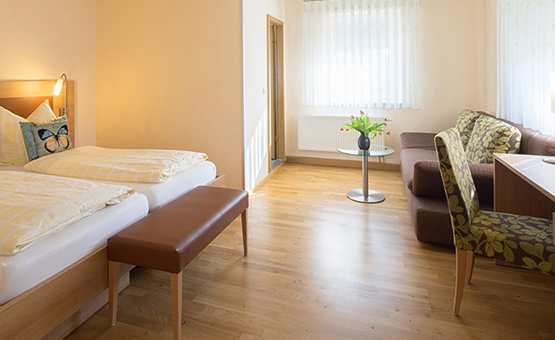 All guestrooms are modernly furnished. The "Goldener Löwe" is open all-the-year and the reception is open from 7 a.m. to 10 p.m. If you arrive outside of the reception hour, please call us. Our inn is open from 5 p.m. to 9.30 p.m. every day except on Fridays for our residents. 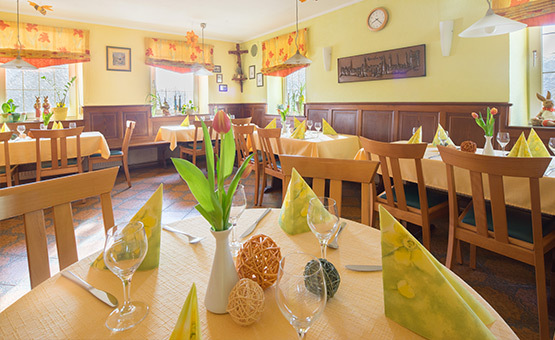 Here you can enjoy traditional cuisine with Swabian specialities. Our beer-garden invites you to relax and enjoy the summer. Finish off your day with a cool beer while your children romp around our playground.